In consists of a second 3,000 mAh battery and a 32GB microSD card. This definitely sound like a pretty good deal and we can’t help but notice the subtle undertone of the gift set. LG could have easily gone with a case, protector, headphones or any other accessory, but the selected items are surely meant to bring extra attention to the fact that LG’s flagship has use for both items, which is more than some of its competition can boast. Samsung’s Galaxy S6 and S6 edge, for example, are void of both a removable battery and a microSD card slot and HTC’s One M9 is also missing the former. It could just be a nice coincidence, but it does look like some clever marketing work. There is, however, somewhat of a catch. To accommodate all possible distribution channels, the campaign requires quite a lot of manual work. To be eligible for the gift, you are required to fill out a few forms and even send a photo of you units IMEI or MEID and proof of purchase. The form also contains some interesting question about competitor products, like which ones you considered before opting for an LG G4. This is sort of a hustle, but, the gift definitely seems good enough to be worth the effort. 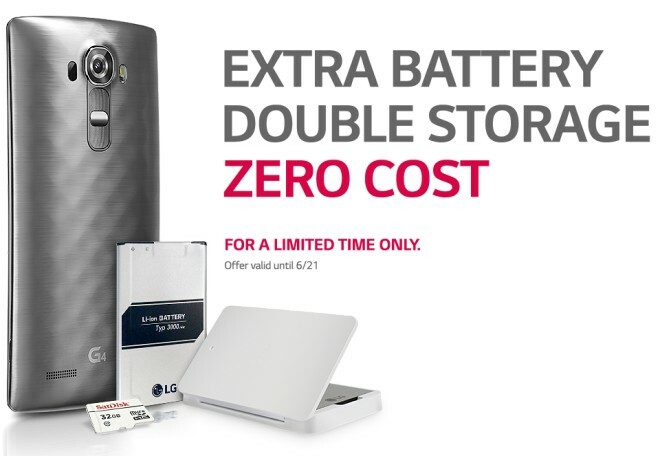 The promotion will last until June 21, so, if you intend to pick up an LG G4, be sure to remember about the deal.